Gaby Horowitz and Bruce Roman Anyone who has ever played a game of backgammon in a more sophisticated manner than aimlessly moving checkers about a board has experienced the magnitude and severity to which the game can affect one's emotions. With this concluding principle we will cross the boundary between physical and mental backgammon to explore the various emotions we may encounter in ourselves as well as in our opponents. The most common untoward emotion in backgammon is steaming. The World Book dictionary defines steaming as "showing anger or irritation." In backgammon, steaming occurs when a player has reached his "boiling point." Characterized by doubling without a sufficient advantage and accepting cubes that should be declined, the player's mental computations become irrational rather than prudent. Rather than deciding upon the cube as one would a business venture, it becomes an affaire d'honneur. Steaming usually occurs when the player is losing and particularly if his opponent has turned around one or more big games. This tends to offend one's sense of justice. The player strikes out in response to this travesty of fairness. Ironically, this usually denotes the genesis rather than the denouement of his misfortunes. Steamers, regardless of their skill level, are the most desirable opponents with whom one can engage in play. Assume that you, as an intermediate player, have a choice between two opponents, A and B. A is a weak player who is financially prosperous and indulges in the game purely as a distraction. Rarely becoming perturbed or affected by a series of misfortunes, he has a very high boiling point. Opponent B is a fine technician who derives his sustenance solely from backgammon. Overly tense and nervous, he is known to have a very low boiling point; i.e., he steams with the best of them. Regardless of the disparity in skill level between Opponent B and yourself, your opportunity for success is greater with him — providing you understand his weakness and exploit it. Due to the unpredictability of the game, you need do nothing more than patiently wait for one or two games to go sour on him. Against your thoroughbred steamer, one or two unfortunate games is sufficient for him to begin doubling early and, most importantly, taking late. Interestingly, steaming can occur when a player is not losing but becomes angry due to something said or done by an opponent or kibitzer. A particular Los Angeles player is very superstitious and bars certain kibitzers whom he believes bring him bad luck. Most club members are aware of this person's problem and courteously attempt to not watch him play — especially when he's in the box. One evening a new club member, uninformed as to this person's infirmity, was kibitzing his game. When asked to leave sans explanation, he regarded it as a personal affront and refused to depart. An altercation ensued, followed by a "ruling," and the new club member was told to leave. Unfamiliar with this brand of hospitality, he responded with a flurry of invective before exiting. Visibly unnerved, Mr. Superstitious lost the subsequent game in the box and proceeded to become −26 on the score within the next several games. At this point, he barred everyone, obviously implying that they were the cause of his misfortunes. We will leave it to the reader to adjudicate the true source of this person's calamities. Another character, whom we will call Mr. X, makes his appearance at the club approximately at midnight (two hours before closing time). Methodically noting everyone's score, he attempts to enter the chouette with the greatest number of "donators." Content to win several points and quickly leave, Mr. X is a hit-and-run artist. One evening, as Mr. X was playing his first game in the box, he reached the position illustrated in Diagram 1. As Black, he was enjoying the position until White produced a key 6-2, hitting the blot on the nine point. He nervously rolled — and danced! The team immediately redoubled to 4 and Mr. X reflexively grabbed the cube, securing the dubious honor of being its possessor. The last vestiges of his smile evaporated as he finally reentered, rolling a 1-5 in Diagram 2. Losing a gammon and a substantial number of points, Mr. X paid top dollar for his steam take. A steam take is frequently generated by a sudden and dramatic shift in positional advantage from one player to the other. The span of time in which this shift occurs is too short to allow the change to be easily assimilated by the individual. This triggers an effort to stop (anger) and a denial of that which has just transpired. The steamer takes the redouble so that he may right the injustice which has occurred, and restore his equity in the game to "what it should be." This is almost as effective as selecting tomorrow's Daily Double from last week's racing form. A more moderate expression of steaming can be seen among highly skilled players. At a 1976 tournament in Dallas, two top pros were playing heads-up for money between matches. Playing the last game of a previously agreed upon number of games, the position in Diagram 3 was reached. He is 8 pips behind before his opponent rolls, in a fairly short race. Only a 6-5 forces White to leave a direct shot on his next roll. His inner board has gaps and men piled upon his 5 and 6 points. He knows that the redouble should be declined. But he is also abundantly aware that this game marks his last opportunity to emerge plus for the session. The nominal 6-5 shot equity serves as a nucleus for sophistry which culminates in a justification for steaming. It is not that the advanced player is immune to steaming but rather that his adroit justifications frequently camouflage the truth. Note well that the time to evaluate a player's ability is when he is confronted with adversity, not when all is going his way. Any dilettante can perform well with good dice. Intermediate: "Let's play three games at $100 a point." Expert: "I'm sorry, I dislike short sessions. But I will play you a four-hour session." In this way the more advanced player greatly increases the probability that his skill advantage will have sufficient time to be expressed. This is far superior to gambling for three games in which one or two lucky rolls may determine the winner. Due to the nature of tournament play, measures inapplicable in money games are often quite appropriate in match play. This fact is often used to justify steaming in a tournament. Diagram 4 illustrates a position that occurred in a match between two skilled players at the 1977 Bill Eisenberg Cup in Los Angeles. In the previous game, Black, trailing 4 to 5 in a match to 11, backgammoned his opponent to obtain a 7–5 lead. Steaming, White doubled early in the next game, justifying his action with the fact that he was behind in the match. In most instances emotional influence clouds one's mind only in the absence of knowledge. Compounding the mistake of the early double, White accepted the redouble in Diagram 4 and thus played for the match from that position. If White had really understood that the match was not yet lost and that a comeback was certainly possible, he would have greatly increased his chances for success. Frequently, we have observed players applying emergency measures in situations in which no real emergency exists. Being behind 9 to 5 (or more probably 8 to 5 if he hadn't offered the early double) is a more advantageous position to be in than playing for the match from the position in Diagram 4. 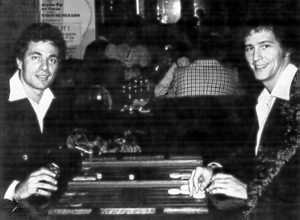 Alan Martin, a former student of Gaby's, was playing a very weak opponent in one of the early rounds of the 1979 American Backgammon Championships in Las Vegas. Down 7 to 11 in a match to 15, Alan gammoned his opponent with the cube at 2 to tie the score at 11–11. Remaining upset at being gammoned, his opponent redoubled Alan to 4 in Diagram 5. Ironically, the redouble is excellent. White is essentially gambling the entire match on this 5-shot and the existing racing equity — both non-skill confrontations. Due to the great skill disparity, this is the best chance to win the match. In reality, however, White was not evaluating the Opponent Factor but merely steaming (he probably would have offered the same redouble in a money game). While many fine players would have taken the redouble, Alan wisely decided to decline. He was unwilling to give his inferior opponent the opportunity to win the match in one roll. Your best defense against the steamer is patience. Alan, now behind 11 to 13, continued on to win the match and the entire tournament to become the American Backgammon Champion. Another emotion commonly exhibited in backgammon is fear. The player in fear doubles too late, losing his market, and passes most cubes offered to him. Protecting against 17 to 1 shots rather than observing true priorities, he is often found playing from very inflexible positions. This fear even extends to facing certain opponents to whom he has suffered a substantial loss or several losses. White is in the box in Diagram 6. Black considered doubling but his two partners strongly objected. Acquiescing to their demands, he did not double and rolled a 6-2. The teammates howled at his suggestion of breaking the midpoint (the correct play) but this time the captain insisted and made his play, leaving his opponent six numbers with which to hit him. As White rolled a 4-3, the first teammate groaned, "I'm sure glad I didn't let you double." The second teammate followed with the "astute" observation, "Especially with the way you played the position." The teammates were, amongst other things, victims of fear, not only in their cube handling but in their checker movement. Do not judge results but do what you know to be correct. The above incident is not an isolated occurrence but a ubiquitous "ritual" performed daily wherever backgammon is played.